Love of South Indian food took me to various places across Namma Bengaluru and some of the other cities. 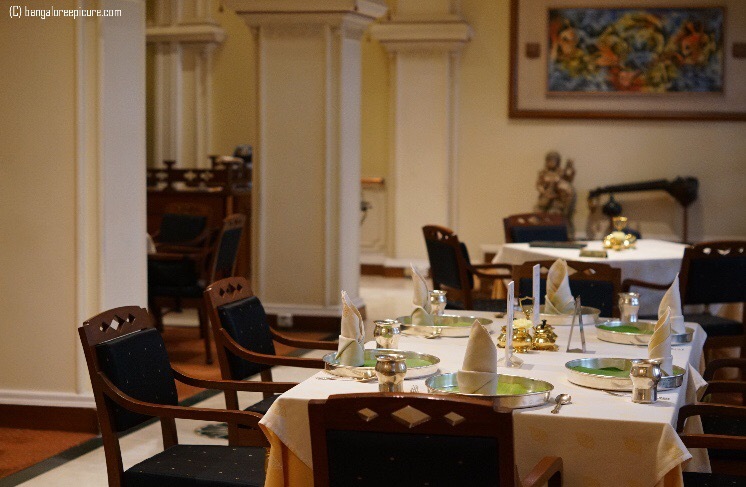 However, visit to Dakshin at ITC Windsor was pending until last month. Well, I was invited for the Onam Sadhya and the experience was epic. To extend the same experience, I had been again to Dakshin a couple of weeks ago along with my better half to celebrate a special occasion. Dakshin at ITC Windsor certainly don’t need any introduction. Since it’s one of the best South Indian Restaurants in Bangalore and the legacy hasn’t changed till date in every other factor. The place décor is Royal with vintage elements. They have recently introduced a fix menu with the name as “Saivam” and “Sampoornam”, where patrons can choose and pick among the options. We have opted for Sampoornam; basically it’s a complete meal with colossal options. Also, it’s unlimited! Sampoornam – This would be a perfect choice for the one who would like to experience complete handpicked dishes of South India. The choices are Dosai from Iyer’s trolley, Vadai, Vazhai Shunti, Padpe Upkari, Beerakai Paal Koora, Idiappam, Urlai Roast, Tarkaari Kurma, Veechu Paratha, Ananas Menskai, Tomato Pappu, Brinji or Bisibelebath, Sambar, Rasam, Curd, Steemed Rice and Curd Rice. And desserts are like Kadal Patchee, Badam Halwa and Elaneer Payasam! Don’t miss their Signature Filter Coffee called Dakshin Kapi. The food was totally top notch and liked every dish! Probably this is the only place where I felt authenticity of South Indian Food is still alive. I have also met Chef. Praveen Anand, a Man behind the creation of Dakshin in various hotels across. He will certainly deserves the title “Master” for his expertise, tenure and politeness at ITC Hotels. We got extremely great service from folks at Dakshin and with this experience I can say “ITC Hotels” are perfect example for great Hospitality. Going forward, I would love to celebrate happy moments and special occasions at ITC Hotels. I would specially like to Thank Mr. Nandish for surprise Cake and taking care of us during this visit. Special New menu with Saivam and Sampoornam would be a great choice if you are at Dakshin and do ask for it. Note: This article is completely based on my personal experience. The first visit to try Onam Sadhya was an Invite and latest visit was paid by me. There are Non Veg options as well. So, please call up the restaurant for the details. Wow nice place and delicious foods.Hope to visit some day!